My name is Florian Kohler. Here with me is Jamillette. Today I'm going to cover a very common question, "How can I up my game?" We're going to go study a bit of strategy, a little bit of pattern playing, and basically how to get better at pool. If you've been following this series, you know how to play pool. But the next step if you want to get better pool is simply to think ahead. A lot of people who are at an average skill level just try to think a ball or two ahead, but for best results you should try and think as far ahead as possible. When I approach a table, the best advice I can give is, after you break, start to analyze your layouts. Look and see how many balls ahead you can think and try to find ways to make your runout easier. It's a little bit complicated to explain, but after some practice it will start to come together. Really, the best thing we can do right now is just break this table and hopefully I can run it out. 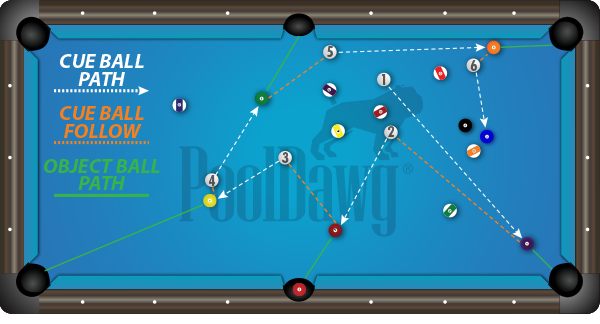 ANALYZE THE TABLE: After the break look for the solid/stripe option that has the easiest path to run out and the least amount of problem balls. All right. So it's a pretty decent break. I kind of lost my cue ball, but I got lucky and it’s still kind of in the middle. At this point, I'm going to analyze the table. So, I made the 3, which is a solid. In the international rules, it doesn't matter what you make on the break, it's just a ball. So if it's a solid or stripe, it doesn't matter. Since the table is open, take a look at the layout of the table and try to figure out which is the easiest to run out. Stripes are pretty good here. The 11 goes, 15 doesn't really go, the 12 goes here, and the 9 goes here. It's not too bad, really. But that 13. I do not like it. It's blocked here, it's blocked by the 2 and it’s blocked by the 4. To me, that's not good. Now the solids. I already made one, so there is one less on the table. The 5 goes, the 4 goes, and if I play good shape on the 5 for the 2, I might be okay. The 6 goes, 7 goes, and 1 goes. They all look pretty good. 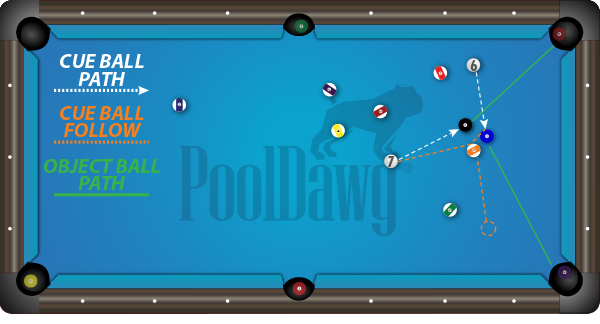 If I want to make the 2, I have to clear that ball first, so I'm going to start off by clearing that 4 and play shape so that I leave the cue ball in the middle of the table. Alright, so that went pretty well according to my plan. I’ve got my cue ball in the middle, so now my plan is pretty clear. I'm going to try and make the 7, then go around. After that, I could go for the 6, but I'm probably going to try for the 1 ball, because if I get good shape on the 1 then I can go for the 6. Then from the 6 I can go down to 5, and if I play good position on the 5, I'm perfect for the 2 ball, and I have a chance of moving towards the 8 ball. PATTERN PLAY: After the break, do your best to read the table and look as many steps ahead as you can. 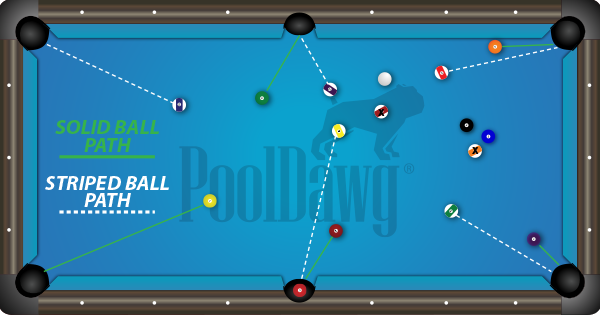 Think about where you want your cue ball to end up when making your plan. Again, this is the plan I made as soon as I saw the table. You have to think 1, 2, 3, 4, 5, 6 balls ahead. Don't worry if it doesn't go according to plan because sometimes you have to make changes, but it's really good to have one. We're going to keep going. I shoot the 7 and play shape for the 1 ball. I'm pretty good here and I’m sticking to the plan, so I want to look at the 6 ball to try to find my line. Look at my tangents. So it's pretty good. All I've got to do is push a little follow here, be straight there. So if I look at my white ball I want it to be somewhere around the 1 ball. 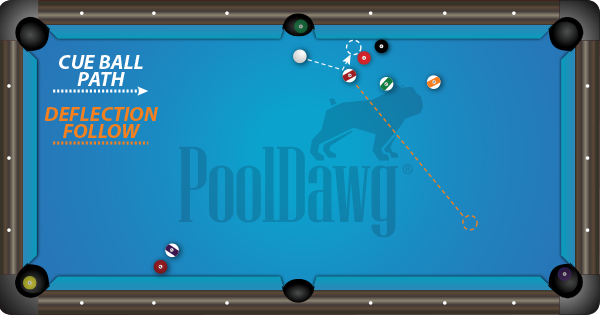 Frank Says: "If you really want to take your game to the next level, you have to check out Dr. Dave’s Video Encyclopedia of Pool Practice! It’s a great DVD series and Disc 3 specifically covers pattern play and safeties." All right so we're still pretty good and hopefully I left myself a good shape for the 6. It is not as good as expected but I'm okay. Again, what I've got to do is try to push the white ball somewhere here. Alright so that's pretty good and it keeps me on track according to the plan. Now here's the tricky part, because I don't have much space here, but I have a few different options. First I'm going to make the 5, which should be no problem, but I need this angle to make the 2.The 2 is going to bring me either into the 8 or into the 13, so I can't really control that. So I really have to think here. Now my best guess is to put a little follow, carom out of the 13, put my white ball somewhere here and then the 8 ball should be in. 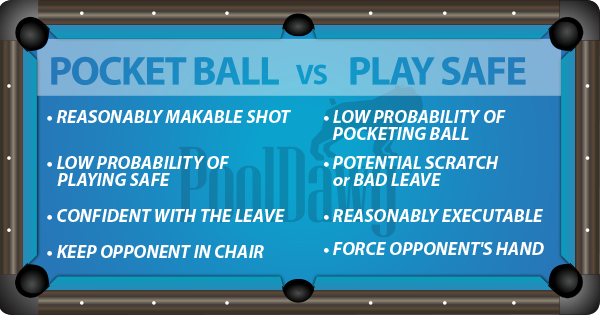 STRATEGY: Players should apply cue ball control to gain favorable positions for their next shots. This is a VITAL skill. Alright so I cheated the pocket a little bit because it was easier to control, but as you can see I got great shape. I don't have really a problem making the 8-ball and I should run out here. Whenever you try and run the table, you always want to try and focus on one zone at a time. So let's say you've got a lot of balls in one area and you want to try and run this side of the table first, before you go down and work on the other end. If you do that, you can get rid of your problems as fast as possible. You don't want to leave problems for the end. Try to open up your clusters as early as you can, because you don't really know what you're going to get. You see in that case I hit it pretty good, but I got another cluster so now I have to hit another stripe. But you know it is still better than how it could have been. CLUSTER BUSTING: In order to make running out easier, try and solve problem areas, like clusters, as early as possible. You don’t want to save your problems for the end of the rack. Pattern playing basically refers to what we just did, which is trying to think several balls ahead, to try to find the easiest layout for you to run out. So never try to complicate it. Sometimes it's just not possible to run out. If your opponent leaves you in a really bad position, you have no other choice than to play a safety. You have to know how to play a safety shot. Let's just try a normal safety. Let's say you can't see your 8-ball, it's masked or something like that. In some games it's just impossible to run the table. You know sometimes you get to a problem and really it's too dangerous to attack, because if your opponent is really good you leave a ball, he's going to finish and you're done. So sometimes you have to play a safety shot, something like that this. It's very easy. All you've got to do is just you know mask the ball here, and your opponent really can't do anything. He can't see your ball. SAFETIES: Being able to execute a safety is an important aspect of pool because it’s your best opportunity to play defense. There are many safeties, that was just one, but you can do things like that. Let's say you are stripes, and all these stripes are messed up you can try something like that and just put it behind it. When pattern playing and running out the table doesn't work, just remember play safe, make it difficult for your opponent to run out. A safety is never to be underestimated, it's a very useful tool in the game. Now remember, to get better at pool, it's definitely a lot of practice. Try to think ahead, pattern play, shoot safeties and really, you know what, I'm going to say it again. Practice. DECISION MAKING: You have to know when to try and pocket a ball and when to play a safety. This lesson was slightly different than the other ones, but I hope you got some good things out of it. It's very hard to explain how to get better at pool, but you know my biggest advice is practice, practice, and practice. And the more you get used to it, the better you'll be. Again, remember, if you want to see more subscribe to my channel right here. 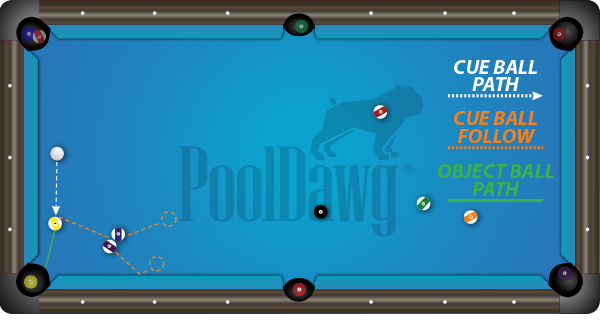 And don't forget to check out PoolDawg.com for all of your pool and billiard supplies.